A division bench presided by Calcutta High Court Chief Justice T.B. Radhakrishnan has declared that Medical Council of India (MCI) and state medical councils (SMCs) must take appropriate disciplinary action if a complaint is lodged against any doctor associated with “doctors’ strike”. Supreme Court of India previously said that doctors have no right to go on “strike” under any condition in response to a PIL filed in 2012 by PBT. Echoing the Apex Court Judgment, Calcutta High Court directed last week that complaint must be lodged with the medical council against the striking doctors for violation of the law and appropriate disciplinary action must be taken by the medical council against the striking doctors. A new public interest litigation (PIL) was filed in Calcutta High Court seeking ban on publishing any picture of Mamata Banerjee, Bengal chief minister or any other minister in paid government advertisements as Supreme Court of India had previously directed that except for the President and Prime Minister, no advertisements by the government may publish any picture of chief minister and other ministers. Unfortunately, despite such categorical direction from the Apex Court, large number of advertisements are published in newspapers and TV on a daily basis with prominent picture of the CM and other ministers that implicitly, if not explicitly, promote the ruling political party at taxpayers’ expense. These brazen advertisements published daily by the ruling government clearly violates Supreme Court’s direction and undermines sanctity of the highest court of the land. While PBT remains as a completely neutral non-political entity and other state ministers may also be involved in similar gross abuse of public fund in promoting political agenda of other political parties, this new PIL was filed in Calcutta High Court against the wrongful action by the Trinomul-Congress (TMC) led government in West Bengal. This PIL is likely to come up for hearing on Friday (March 29). 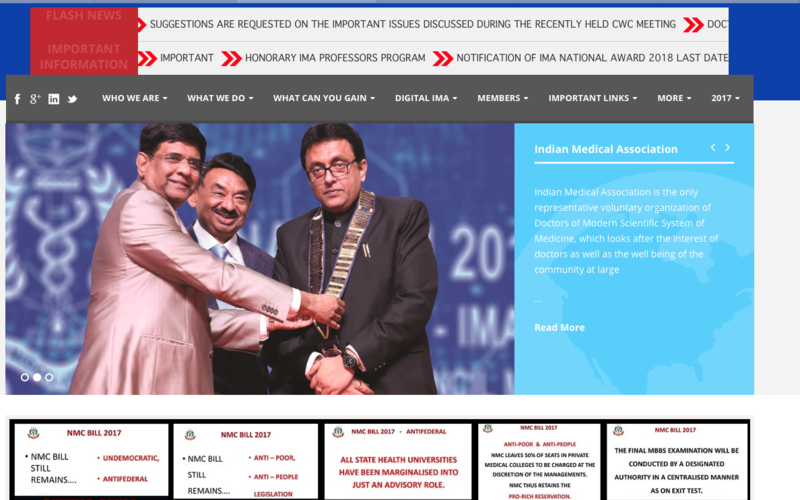 British Medical Journal (BMJ), one of the premier international medical journals in the world, just published an article holding PBT president, Dr. Kunal Saha, as “Role Model” for his long-drawn selfless fight against medical negligence and pervasive healthcare corruption in India (see article below). As BMJ has reported, the relentless battle against medical corruption in India by Dr. Saha started with the tragic death of his young wife (Anuradha Saha) from gross medical negligence by several senior doctors during a social visit to India in 1998. Although Supreme Court of India eventually held these doctors and AMRI Hospital in Kolkata guilty for causing Anuradha’s death and awarded highest-ever compensation (Rs. 11.5 crore) in 2013, Dr. Saha has continued his fight to cleanse the rot in Indian medicine and helping the hapless victims of medical negligence in India through the charitable organization, People for Better Treatment (PBT), that he established in 2001. Although permanently settled in USA for the past almost 30 years, Dr. Saha frequently visits India (at least twice each year) and appears to argue in courts on behalf of the victims of medical negligence and also public interest litigations (PILs) against medical corruption. One of the major aspects in these legal fights has been Dr. Saha’s relentless attempts to bring Dr. Ketan Desai, ex-MCI president and biggest medical mafia in Indian medical history, to justice. Dr. Desai was caught red-handed by the CBI in 2010 for taking bribe from a private medical college but recently, all criminal cases against Desai were dropped by the CBI on a flimsy technical ground. PBT and Dr. Saha are in the process to move the court to bring justice to Dr. Desai and the arbitrary action by the CBI. Calcutta High Court Justice Tapabrata Chakraborty issued show-cause notice on Friday (Jan. 18) against West Bengal Medical Council (WBMC) Registrar and Returning Officer, Mr. Manas Chakraborty, in response to a contempt of court petition filed by PBT president, Dr. Kunal Saha, for disobeying court’s earlier order (see report in Statesman below). In August 2018, HC had directed WBMC to print new ballots with Dr. Saha as a candidate for election of new WBMC members as the 5-year term of the present members expired last November. Dr. Saha had alleged that WBMC had rejected Dr. Saha’s application to contest in the council election because of personal animosity on the flimsy ground that Dr. Saha had written his name in the nomination paper as Kunal Saha and not as “Saha Kunal” which is the way it is written on Dr. Saha’s registration certificate. Calcutta HC agreed with Dr. Saha and held that there was no reason to dismiss Dr. Saha’s nomination paper on this obvious anomaly with his name and directed the Returning Officer (Registrar) to print new ballots with Dr. Saha’s name as a candidate. Interestingly, no election for new WBMC was held till now as the matter has been stayed by another bench of Calcutta HC. While there is wide-spread hostility among the members of the medical community toward PBT and Dr. Saha for their role in helping the victims of “medical negligence” in India, Dr. Saha contested in the council election last time to stem the corruption in the election process that has been rigged in the past by influential doctors linked with the ruling political party. The present WBMC president, Dr. Nirmal Maji, is a sitting MLA for the ruling TMC party in West Bengal who was promoted recently to be the Minister of Labour by Bengal CM, Mamata Banerjee, even after he was indicted for serious criminal offense including extortion of funds from the medical council (IPC Section 409). Dr. Nirmal Maji, president of West Bengal Medical Council (WBMC) and a prominent political-medical leader in West Bengal who was recently promoted by Bengal CM Mamata Banerjee to be the state minister of labor, surrendered on Tuesday (Jan. 8) before the Special Judge (for MLAs/MPs), Mr. Somnath Chakraborty, charged with serious criminal allegations under Indian Penal Code (IPC) including Section 409 (“breach of trust by a public servant”) and Section 463 (“forgery”). Later, he was released on bail with the next day of hearing fixed on 2nd March, 2019 (see news below). This shocking criminal case for alleged extortion of public funds from the office of the WBMC by Dr. Maji to pay for his personal legal expenses was filed by PBT president, Dr. Kunal Saha after PBT was able to obtain serious incriminating evidences against Dr. Maji. Dr. Maji is already facing another criminal case for “defamation” (IPC Section 500) which is ready to go to a trial. Punishment under IPC Section 409 may be imprisonment that may extend up to 10 years. PBT has filed a memorandum with Bengal CM urging her to remove Dr. Maji from the post of WBMC president and minister of labor until he is exonerated from these serious criminal allegations. Eighteenth anniversary of PBT will be celebrated at 3 PM on Sunday (December 30) at Rotary Sadan in Kolkata (next to Nehru Children’s Museum) where victims of alleged medical negligence will tell their stories of maltreatment and struggle for getting medical justice. An open discussion will be held by distinguished guests along with PBT president, Dr. Kunal Saha, who has come, like every past years, to attend this momentous occasion. Following day, i.e. Monday (December 31) at 1 PM a massive public protest rally has been organized in front of West Bengal Medical Council (WBMC) office at 1B-196, Sector III, Salt Lake, Kolkata 700106. This public demonstration will be held in demand of speedy justice against negligent doctors and also seeking immediate removal of WBMC president and local leader of the ruling TMC party, Dr. Nirmal Maji, in view of his recent criminal indictment for alleged money laundering from the WBMC office. All conscientious citizens, victims of medical negligence and “honest” doctors are cordially invited to join us for these two major movements on December 30 and 31st. For more information, contact PBT secretary, Ms. Ratna Ghosh (Tel: 9836706952) or PBV vice-president, Mr. Mihir Banerjee (Tel: 9831983670). Controversial medical leader, Dr. Nirmal Maji, a sitting MLA for the ruling TMC party and president of West Bengal Medical Council (WBMC), was recently elevated to the post of State Minister in the Department of Labor by Bengal CM, Mamata Banerjee. Over the years, Dr. Maji has been center of numerous controversies including using his influence to orchestrate dialysis of his pet dog at SSKM Hospital, a premier super-speciality government medical center for humans in Kolkata. But earlier this month, a Special Court for MLAs/MPs took cognizance of several criminal charges including “criminal breach of trust by a public servant” (IPC Section 409) and “forgery” (IPC Section 463/464) and directed Dr. Maji to surrender before the court on 5th January, 2019 (see copy of Order below). These criminal charges were brought against Dr. Maji by Dr. Kunal Saha on behalf of PBT after PBT obtained documents showing that Dr. Maji was using funds from the medical council by hiring lawyers to defend in personal litigation against him which clearly violates IPC Section 409 for criminal breach of trust by a public servant that calls for a non-bailable warrant with a maximum imprisonment of 10 years if convicted. It is shocking that despite being criminally indicted for such serious charges by the Special Court, Bengal chief minister rewarded Dr. Maji by offering him to the coveted post of a State Minister. PBT sent an urgent Memorandum to Mamata Banerjee on Saturday urging her to remove Dr. Maji from the post of a State Minister until he is exonerated from the serious criminal charges in order to restore public trust and confidence in governance of West Bengal. In a shocking and unbelievable development, a large group of advocates harassed PBT president, Dr. Kunal Saha and threatened him with dire consequences if he does not stop from arguing cases on behalf of victims of medical negligence. Ever since Dr. Saha personally argued and won a historic verdict and highest-ever compensation from Supreme Court for the wrongful death of his wife, Anuradha Saha, he has been appearing before the National, State and District consumer forums coming all the way from his permanent residence in USA to argue cases on behalf of many alleged victims of medical negligence. Dr. Saha came to India last week and appeared before the W.B. State Consumer Forum today to argue for a victim, Abhijit Banik, whose young wife died from alleged medical negligence following delivery of a child. For some reasons, the bench presided by state forum president, Justice Mr. Ishan Chandra Das, refused to allow Dr. Saha to argue on behalf of the victim. Even more shockingly, a large group of lawyers also started to shout against Dr. Saha and PBT. They chased Dr. Saha out of the courtroom and threatened him with dire consequence and other abusive languages. Finally, police escorted Dr. Saha from the court premise. Later, a formal complaint was lodged with the local police station seeking a thorough investigation and appropriate action against the rowdy lawyers who were involved in this deplorable incidence. Law clearly provides that non-advocate and/or NGO can plead cases on behalf of the victims. In 2012, PBT moved a contempt petition against National Consumer Forum (NCDRC) for not framing necessary rules to allow non-advocates to argue on behalf of ordinary people including victims of medical negligence after Apex Court gave specific direction in this regard. PBT will move the higher courts against today’s decision by the W.B. Consumer Forum not to allow Dr. Saha to argue medical negligence cases. CBI Blatantly Distorts RTI Act To Refuse Information About Corruption Charges Against Dr. Ketan Desai: Is BJP Government Trying To Shield Desai And His Cronies? The CBI Court in Patiala House, New Delhi recently dropped all criminal charges against ex-MCI president, Dr. Ketan Desai, after CBI lawyers submitted that “sanction” (under Section 197 CrPC) to prosecute Dr. Desai was denied by the Gujarat government. As well known across India, Desai was caught red-handed by CBI in 2010 allegedly for taking a huge bribe from a private medical college in exchange of granting MCI recognition to admit MBBS students. While Desai was in jail for almost 7 months before he was released on bail, MCI was dissolved under unrelenting public pressure. Almost 8 years later, all charges for corruption against Desai have now been dropped by CBI before the start of the trial on a flimsy and technical ground of “sanction” bringing utter shock to the entire medical community. In order to look into this apparent dubious behavior by the CBI prosecutors, PBT had sought pertinent information (under RTI Act) in relation to CBI’s stance to drop all charges against Dr. Desai. The information sought included simple questions like why a routine “sanction” was denied by the government and why Gujarat government was approached to seek “sanction” instead of the central government as Desai was arrested as the MCI president and not as a government employee in Gujarat. Incredibly, CBI has refused to provide any answer to PBT’s questions with a bogus claim that RTI Act is “not applicable” to the CBI under Section 24 even though the said Act has categorically stated that CBI must provide information under RTI Act if the information pertains to “allegations of corruption” (see CBI response below). Of course, the criminal case CBI filed against Desai was exclusively related to “corruption”. PBT has already lodged an appeal with the Central Information Commission (CIC) against this blatantly biased denial of information under RTI Act. But a bigger question is why CBI is blatantly distorting truth to protect information about Desai? Is the BJP government trying to thwart justice from the most corrupt man in Indian medical history? Medical Council of India (MCI) was dissolved last month and replaced with a selected group of 7 members Board of Governors (BOG) headed by Dr. Vinod K. Paul allegedly to stop corruption and to pave the way for the proposed National Health Commission (NMC) Bill. But nothing really has changed since BOG has taken over the past several weeks except that MCI website has remained completely defunct denying ordinary citizens of vital healthcare information and the alleged corruption inside MCI has certainly been replaced by sheer anarchy at the expense of the countless victims of medical negligence. PBT has received complaints from victims whose complaints against the delinquent doctors (under section 8.7 and 8.8 of MCI Code of Ethics Regulations, 2002) were scheduled for hearing by the MCI Ethics Committee long before MCI was dissolved. These unfortunate victims never received any information from MCI or BOG that their pre-scheduled hearings were cancelled or postponed due to the evolving situation. Most of these innocent justice-seekers were kept completely in dark until they traveled to the MCI office in Delhi from all parts of India only to find closed doors. It is reported that even the handful of MCI employees who are still there are not working as only few members BOG only attending inside MCI. We can appreciate the difficulty that the BOG may be facing during this transition period but nothing can be more important for the BOG members to inform the hapless victims who are compelled to travel long distance only in search of medical justice that they should not come to MCI office as their pre-scheduled hearings have been postponed/cancelled. PBT has written to the BOG chairman, Dr. Vinod K. Paul, seeking his immediate intervention to stop this outrageous situation and to compensate the victims who have already attended MCI office on the day of their pre-scheduled hearing. PBT encourages all victims and justice-seekers who have attended or will attend MCI to participate in the Ethics Committee hearings to contact PBT office with their grievances as PBT intends to bring a new public interest litigation (PIL) on this issue if BOG fails to take immediate and appropriate measures. MCI Abruptly Dissolved Days After 8-Year Old Corruption And Bribery Case Against Dr. Ketan Desai Is Dropped By CBI On Flimsy Ground Of “Sanction”: Is Our Government Trying To Fight Or Breed More Corruption? Over the short period of less than a month, two shocking incidences took place in Indian medical jurisprudence that may or may not be linked with each other but that will certainly have major implications in spread of medical education and healthcare delivery system across the nation. In the first incidence which surprisingly remained unreported by the media, the long-lasting criminal case against Dr. Ketan Desai, ex-MCI president and most well known corrupt medical leader who was caught red-handed by CBI in 2010 allegedly for taking a huge bribe from a private medical college, was freed by the Patiala House Court, New Delhi after CBI submitted that Gujarat government declined “sanction” to prosecute Dr. Desai. “Sanction” (under CrPC Section 197) is a purely technical and routine legal process that may be obtained from the authority before prosecution of a allegedly corrupt public servant. Supreme Court of India has repeatedly held that “sanction” may not be even necessary before prosecution of a public servant involved with corruption. It is also a puzzle why CBI went to Gujarat government, instead of the central health ministry, seeking “sanction” when Dr. Desai was apprehended for taking bribe as MCI president. PBT president, Dr. Kunal Saha, had West Bengal Medical Council president and several members indicted for “criminal conspiracy” (under IPC section 120b) in 2001 and Calcutta High Court categorically dismissed the same plea of “sanction” adopted by the accused doctors. The second major incidence took place last month, which was also widely reported by the media, involves BJP government’s abrupt move to dissolve entire MCI and replace it by seven hand-picked doctors (“Board of Governors”) by passing an “Ordinance”. The government has made a bogus plea that since the proposed National Medical Commission (NMC) Bill is likely to be approved soon and since the 5-year term of the elected members of the present MCI would expire soon, MCI is no longer needed. But what would happen if the proposed NMC Bill fail to be passed in the parliament soon? Also, government was well aware for a very long time that the regular term of the present MCI members would expire in late 2018. Why the health ministry did not make any plan in a democratic manner to hold election in time to replace the present MCI members? Instead, they now make this untenable claim that since the present MCI members’ term would end soon, entire MCI must be replaced with a few doctors chosen by the government. The MCI website has been down since this shocking disbandment of MCI. PBT is also deeply concerned about what is going to happen with the victims of medical negligence whose complaints are currently pending before the MCI Ethics Committee. But PBT and ordinary people of India are mostly concerned to imagine whether the two strange and major incidences last month are orchestrated by the one and same corrupt doctors and unscrupulous political leaders in India. A Judge in the “Special Court” in Barasat, West Bengal created for delivery of expedited justice for criminal complaints pending against corrupt and unscrupulous MLAs and MPs issued charge-sheet under Indian Penal Code (IPC) Section 120b (criminal conspiracy) and Section 500/501 (criminal defamation) against Dr. Nirmal Maji, sitting West Bengal Medical Council (WBMC) president and a powerful MLA of the ruling Trinomul-Congress (TMC) party in West Bengal, and fixed December 1, 2018 for further proceedings of the trial (see news below). This unprecedented criminal case started last December after PBT president, Dr. Kunal Saha, lodged allegations against Dr. Maji for making untrue and slanderous attacks against him following publication of reports regarding Dr. Saha’s complaint to the Medical Council of India (MCI) against Dr. Maji for his role in planning to perform dialysis of his pet dog at the SSKM Hospital, a premier tertiary-care government hospital in Kolkata putting the lives of countless innocent patients at serious risk of contracting new “zoonotic” diseases. Ironically, everybody from the medical community including the Indian Medical Association (IMA) and Mamata Banerjee-led state government in West Bengal remained absolutely silent against the brazen and potentially harmful activity by Dr. Maji until PBT lodged a formal complaint with the medical council demanding cancellation of medical registration of Dr. Maji for his unethical action. A separate criminal complaint against Dr. Maji alleging extortion of funds from the state medical council will be heard by the same court in Barasat next week. In a remarkable demonstration of delivery of medical justice, Medical Practitioners Tribunal Service (MPTS), highest legal tribunal to adjudicate complaints of medical and ethical violations against doctors practicing in United Kingdom (UK), has held Dr. Pantula Sastry, an Indian cancer specialist, guilty for professional misconduct and permanently canceled his practicing license in UK for causing death of a 55-year old patient who was suffering from blood cancer. The most striking aspect of this unprecedented decision by the tribunal in UK is that the victim was wrongly treated by Dr. Sastry resulting in her death in a hospital in Mumbai, and not in England (see attached judgment below). The victim, Sushma Agarwal, was admitted at Kokilaben Dhirubhai Ambani Hospital in Mumbai in 2014 under care of Dr. Sastry for Non-Hodgkins Lymphoma when she was treated with bone marrow transplantation without taking minimal precaution leading to death as held by the judges at MPTS. Although victim’s family lodged a complaint against Dr. Sastry with the Maharashtra Medical Council, Dr. Sastry relocated to UK in 2015 and started practicing there. As victim’s son also lodged a complaint against Dr. Sastry with the medical council in UK (GMC), the complaint was referred to MPTS which after a thorough investigation and taking opinions from medical experts came to the conclusion that Dr. Sastry was grossly negligent in his treatment of Mrs. Agarwal in the Mumbai hospital. The Tribunal also casted serious doubt on doctor’s credibility and permanently removed Dr. Sastry’s medical registration by holding that his “conduct was so unacceptable, that it is fundamentally incompatible with continued registration“. Ironically, the complaint against Dr. Sastry that was lodged with Maharashtra Medical Council has still remained undecided even after 4 years. Do we still have to wonder why public has lost complete trust on doctors and medical councils in India?